Airport: Budapest Ferenc Liszt International Airport. Budapest International Airport arrivals and departures lounge between terminal 2A and 2B, named SkyCourt. 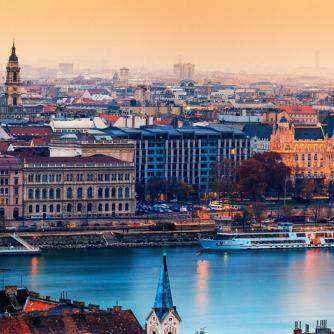 Budapest is served by Budapest Ferenc Liszt International Airport (BUD) (named after Franz Liszt, the notable Hungarian composer), one of the busiest airports in Central and Eastern Europe, located 16 kilometres (9.9 mi) east-southeast of the centre of Budapest, in the District XVIII. The airport offers international connections among all major European cities, and also to North America, Africa and the Middle East. As Hungary's busiest airport, handles nearly all of the country's air passenger traffic. Budapest Liszt Ferenc handled around 250 scheduled flights daily in 2013, and an ever-rising number of charters. London, Brussels, Frankfurt, Munich, Paris, and Amsterdam are the busiest international connections respectively, while Toronto, Montreal, Dubai, Doha and Alicante are the most unusual in the region. Today the airport serves as a base for Ryanair, Wizz Air, Budapest Aircraft Service, CityLine Hungary, Farnair Hungary and Travel Service Hungary among others. The airport is accessible via public transportation from the city centre by the Metro line 3 and then the airport bus No. 200E. As part of a strategic development plan, €561 million have spent to expanding and modernising the airport infrastructure until December 2012. Most of these improvements are already completed, the postponed ones are the new cargo area and new piers for terminal 2A and 2B, but these development are on standby also, and will start immediately, when the airport traffic will reach the appropriate level. SkyCourt, the newest, state-of-the-art building between the 2A and 2B terminals with 5 levels. Passenger safety checks were moved here along with new baggage classifiers and the new Malév and SkyTeam business lounges, as well as the first MasterCard lounge in Europe. Public transit in Budapest is provided by the Centre for Budapest Transport (BKK, Budapesti Közlekedési Központ), one of the largest transportation authorities in Europe. BKK operates 4 metro lines—including the historic Line 1, the oldest underground railway in continental Europe—, 5 suburban railway lines, 33 tram lines, 15 trolleybus lines, 264 bus lines (including 40 night routes), 4 boat services, and BuBi, a smart bicycle sharing network. On an average weekday, BKK lines transports 3.9 million riders; in 2011, it handled a total of 1.4 billion passengers. 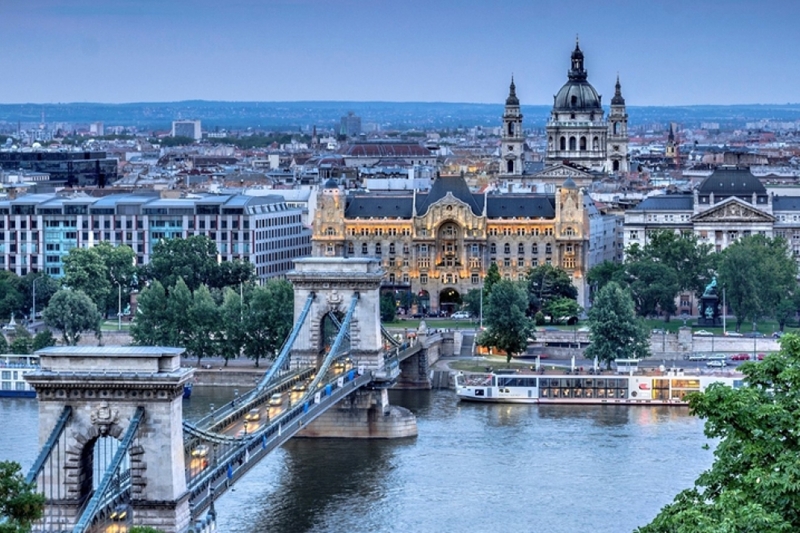 In 2014, the 65% of the passenger traffic in Budapest was by public transport and 35% by car. The aim is 80%–20% by 2030 in accordance with the strategy of BKK. The tram lines no. 4 and 6 are the busiest city tram lines in the world, with one of the world's longest trams (54-metre long Siemens Combino) running at 2–3 minute intervals at peak time and 4–5 minutes off-peak. Day services are usually from 4am until 23pm-0.30am. The night service has a reputation for being excellent. Hungarian State Railways operates an extensive network of commuter rail services, their importance in the suburban commuter passenger traffic is significant, but in travel within the city is limited. The organiser of public transport in Budapest is the municipal corporation Centre for Budapest Transport (Budapesti Közlekedési Központ – BKK), that is responsible for planning and organising network and services, planning and developing tariff concepts, attending to public service procurer duties, managing public service contracts, operating controlling and monitoring systems, setting and monitoring service level agreements related to public transport, attending to customer service duties, selling and monitoring tickets and passes, attending to integrated passenger information duties, unified Budapest-centric traffic control within public transport, attending to duties related to river navigation, plus the management of Budapest roads, operating taxi stations, unified control of bicycle traffic development in the capital, preparing parking strategy and developing an operational concept, preparation of road traffic management, developing an optimal traffic management system, organising and co-ordinating road reconstruction and even more, in short, everything which is related to transport in the city. Budapest is the most important Hungarian road terminus, all of the major highways and railways ends within the city limits. The road system in the city is designed in a similar manner to that of Paris, with several ring roads, and avenues radiating out from the center. Ring road M0 around Budapest is nearly completed, with only one section missing on the west side due to local disputes. Currently the beltway is 80 kilometres (50 miles) in length, and once finished it will be 107 kilometres (66 mi) of highway in length. Special vehicles in Budapest, besides metros, include suburban rails, trams and boats. There are a couple of less common vehicles in Budapest, like the trolleybus on several lines in Pest, the Castle Hill Funicular between the Chain Bridge and Buda Castle, the cyclecar for rent in Margaret Island, the chairlift, the Budapest Cog-wheel Railway and children's railway. The latter three vehicles runs among Buda hills.